JPMorgan To Get Whale Of A Fine For Trading Losses : The Two-Way The fine is reportedly said to be at least $700 million for what authorities say were massive derivative bets made without adequate risk controls in place. The case became known as the "London Whale" owing to the size of the trades made. 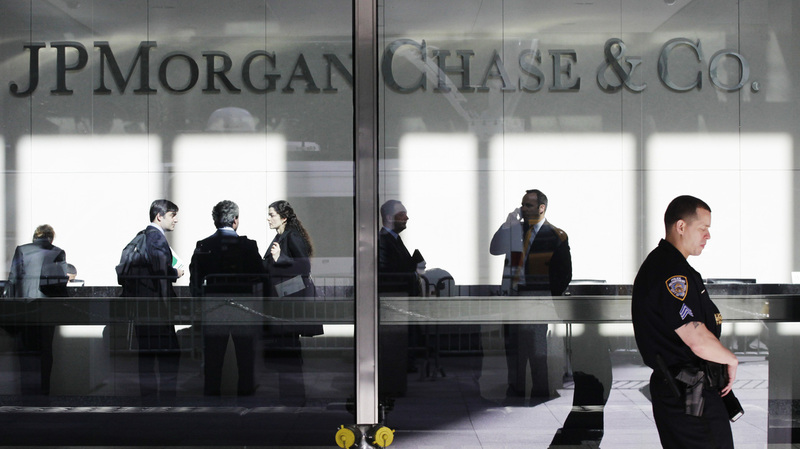 JPMorgan Chase will reportedly pay a $700 million fine to settle allegations that it made risky trades out of its London office that led to more than $6 billion in losses. The current settlement revolves around an investigation from across the federal government and the globe over trading losses, first announced in May, that have ballooned to more than $6 billion. Regulators including the Securities and Exchange Commission and the Office of the Comptroller of the Currency allege that JPMorgan had inadequate risk controls in place when traders made complex derivative bets that ultimately led to the losses. Last month, two traders were charged with covering up the losses. The U.K. trader who placed the bad bets, Bruno Iksil, became known as the "London Whale" because of the large size of the trades he made for the company's London office. Iksil is now cooperating with authorities and is likely to avoid prosecution. "The Commodity Futures Trading Commission, a regulator that oversees the market in which the losses occurred, has balked at joining the broader settlement announcement, the people briefed on the matter said. The agency has focused on whether JPMorgan, by amassing an outsize trading position so large that it distorted the market for financial contracts known as derivatives, 'manipulated' that market. "By potentially striking out on its own, the C.F.T.C. has frustrated JPMorgan's efforts to move beyond the trading losses, the people briefed on the matter said. Those efforts to settle were born out of a recent federal crackdown on the bank." The bank's board is meeting Monday and Tuesday and is expected to approve the fines, though the details could still change. The regulatory actions are expected to be announced later this week.